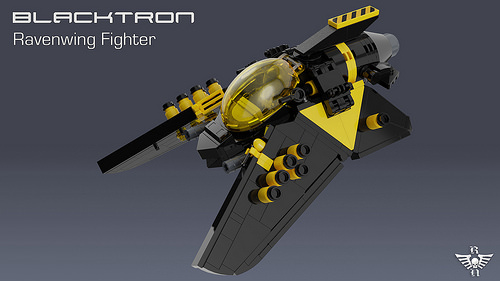 When revisiting a classic LEGO theme such as the first wave of Blacktron sets, as CK-MCMLXXXI does here with his Ravenwing Fighter, you have to really get your head around the original design principles. It seems obvious when pointed out, but the black- and yellow-accented Blacktron fleet references the danger markings of the animal kingdom. The insect quality of this nifty spacecraft draws on this, bringing to mind an angry hornet. Best of all, it takes the triangular Blacktron insignia and uses its angles to form a distinctive bug-wing shape. Marrying this with an abdomen-like cylindrical body completes a near perfect Blacktron vehicle.